It’s here! Finally, right? lol. So we have a new computer, but haven’t had a chance to switch all the data over yet, so we are almost there with having everything back in order. It turned out to be a nice break and allowed myself and my daughter to get over an annoying cold. The first thing I wanted to share once I was able to was how to make the Mod Sailor Dress I made here. I’m going to share a tutorial with how I made it, but sharing things I would change and how to go about making a pattern for your child. I changed things some even for this, but I would add to some of the measurements if I made it again. Start by taking your child’s chest and upper waist measurement. If they differ, go with the highest number. My daughter was the same, 19″. The above picture is of the different pattern pieces you will be creating. A: The strap. This you will have to determine on your own. You could just make the straps tie if you don’t want to worry about it. My pattern piece for the strap is 4″wide x 6.5″ long. B: The top. 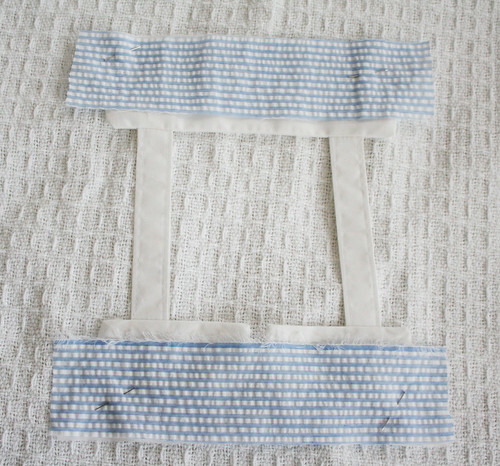 I first cut a rectangle that equaled half of my daughter’s chest measurement plus 1.5. This equaled 11 inches. If I were to do it again, I would add another inch to it making it 12 inches. It fits, but she won’t be able to wear it for too long. Then, decide the height you want it to be. Mine was 3.5″ high. Take your square and fold it in half. Then cut arm holes on the sides (I just guessed, but you could use a shirt if you need some guidance). 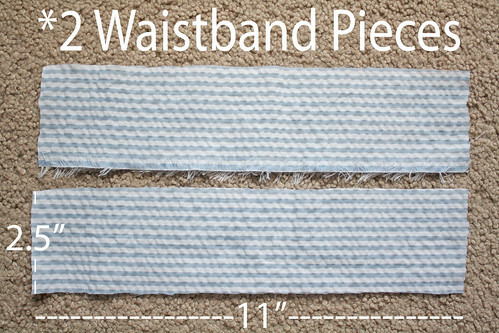 **Cut 2 pieces for lining and 2 pieces to be the front and back** (4 pieces all together. I just used the same fabric for all). C: The waistband. Again, another rectangle. This will be the same length as the top. Mine is 11″ by 2.5″. D: The bottom. 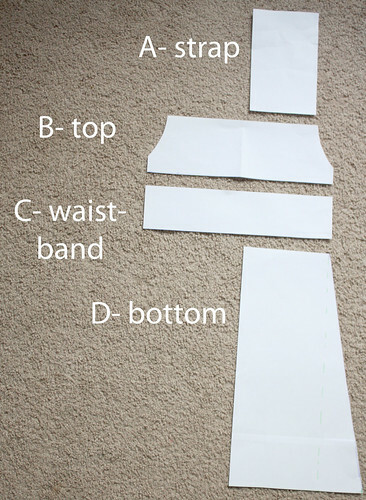 Create another rectangle that is 1/2 of the width of the top and waistband (Ex: 11/2=5.5″). PLEASE NOTE: THE MEASUREMENT BELOW AT THE TOP IS WRONG. IT SHOULD SAY 5.5″. 🙂 The height will be up to you. Mine is 13.5″. Once you have your rectangle, mark over 2.5″ (Again, if I was to redo this, I might add another .5″ to 1″, but she still has plenty of room to run, sit, etc). Then draw a line from the top right corner of the rectangle to the mark at the bottom. This will create an A-line look. 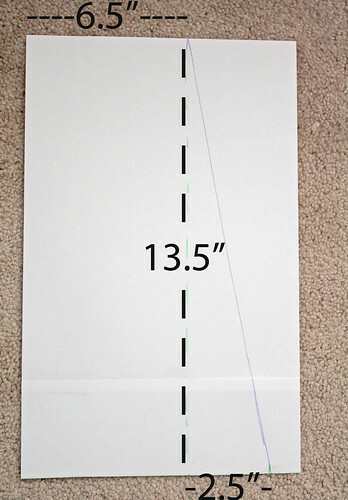 When cutting the fabric, make sure to place this pattern piece on the fabric fold. 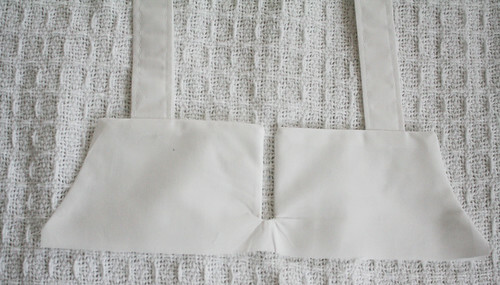 Fold strap piece in half short ways, wrong sides facing. 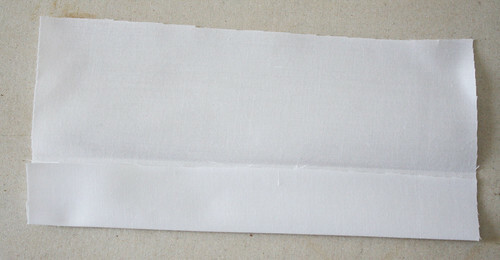 Open and turn in one side to middle crease, wrong sides facing, and iron. Turn other side in as well and iron. 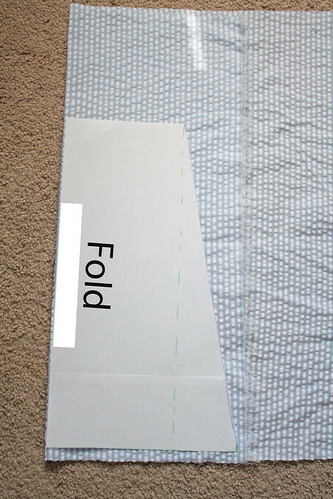 Then fold in half on original crease. 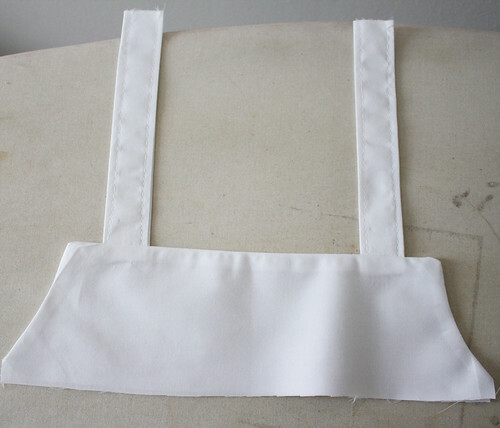 Sew down both sides of strap. Repeat for second strap. Place top front down, right side up. Place straps on top (I did mine about 1/5″ in). Then place lining on top, wrong side facing up. Pin in place. Sew around arm holes and top, leaving the sides and bottom open. Turn right side out and iron. Top stitch if desired. Place back piece right side up. Then place straps on. The straps/front piece will be wrong sides up. Place back lining on top next, wrong side up, and pin in place. 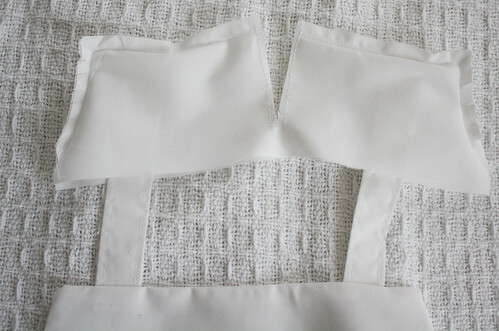 Again, sew around arm holes and top leaving the sides and bottom open. Clip curved seams. 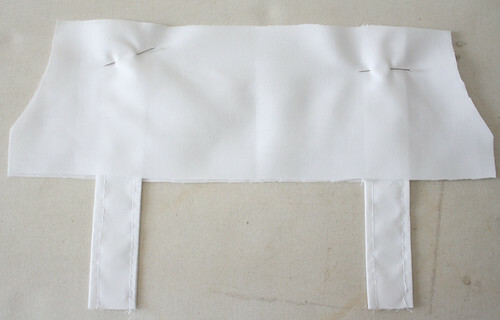 Then you are going to sew a three sided rectangle down the middle of the back. I don’t suggest making it too wide and make sure you don’t go too far down that it would be sewn over later. 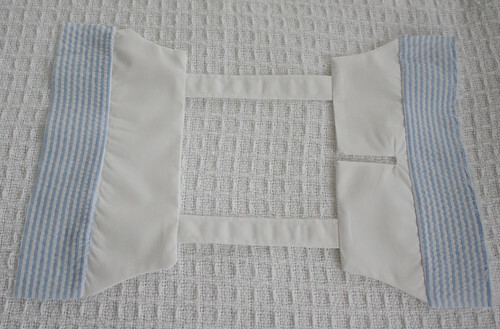 This will help the dress fit over your child. Cut right down the middle of the 3 sided rectangle and make a little slit towards each bottom corner. Be careful not to cut through the stitching. 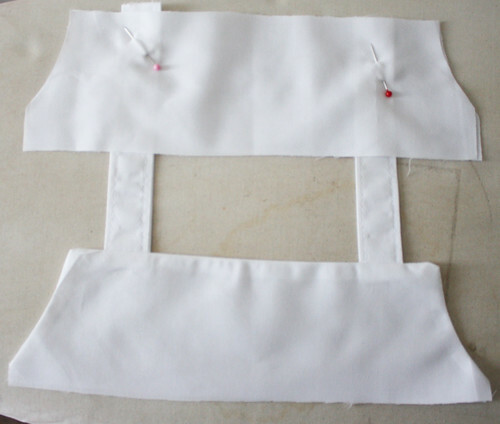 Place waistband pieces onto the top front and the top back, right sides facing. 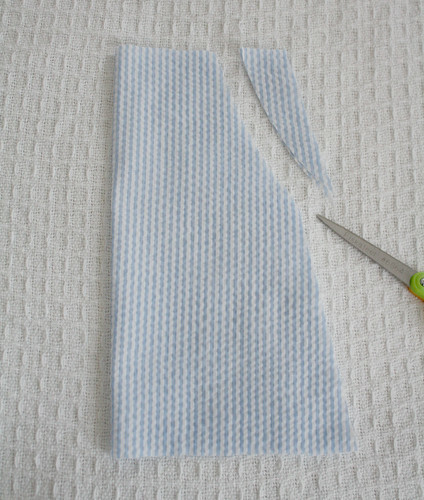 Sew together at the bottom and finish raw edges with a zigzag stitch. Open up and iron seams. Take one bottom piece and fold in half. 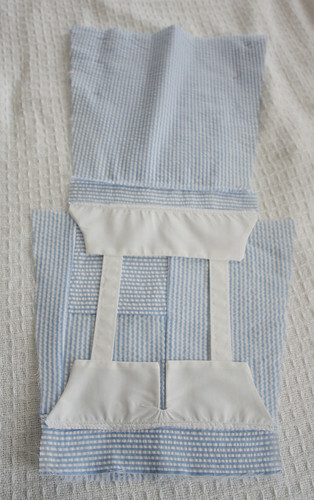 Cut off at the top sides to create the pocket. There’s no math here, I just guess each time I do it. Open up and place right side down. Fold edge up and over where you just cut and iron. Fold over one more time and sew. Repeat for other pocket side. Go ahead and add the six front buttons now. I suggest using embroidery thread if doing it by hand for a stronger hold. Pin the pocket piece, right side up, onto a bottom piece, right side up. Pin the front top to the pocket bottom piece, right sides facing. 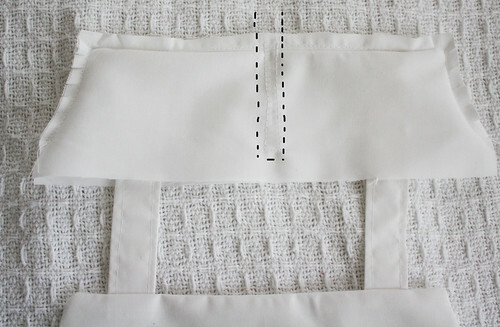 Sew together and finish raw edges with zigzag stitch. Take last bottom piece and pin to back top, right sides facing. 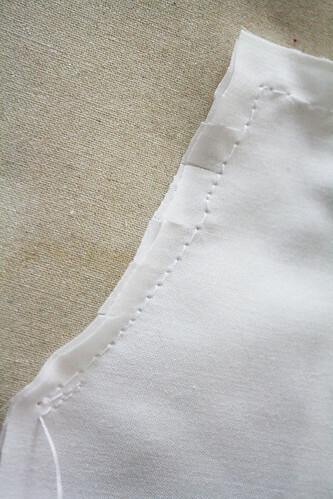 Sew together and finish raw edges with zigzag stitch. 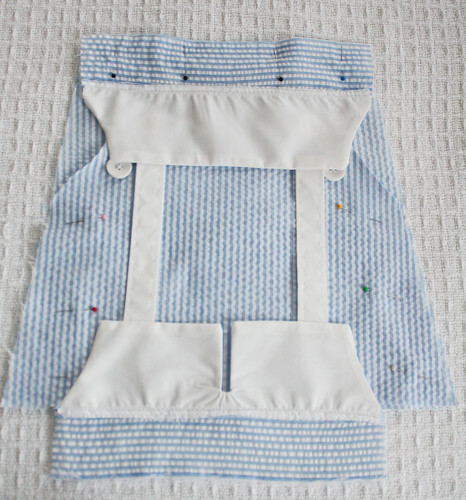 Place the dress together, right sides facing, and pin. 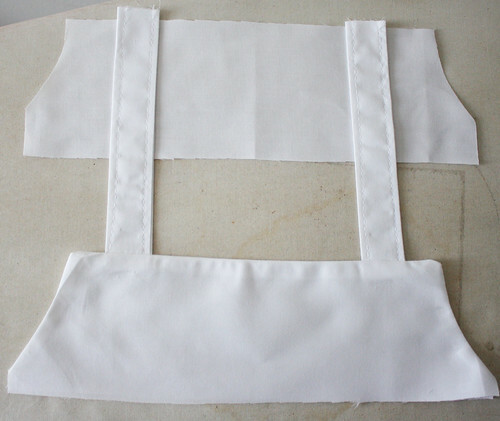 Sew down the sides of the dress and finish raw edges with zigzag stitch. The pocket will be open on the bottom, but the bottom will be hemmed up closing it. Turn right side out. 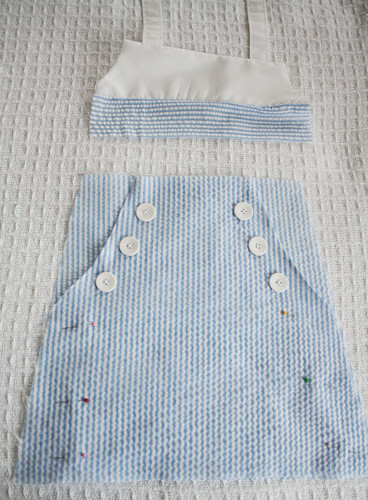 Fold bottom up into the dress 1/4″ and iron. Fold up again 1/4″, iron, and pin in place. 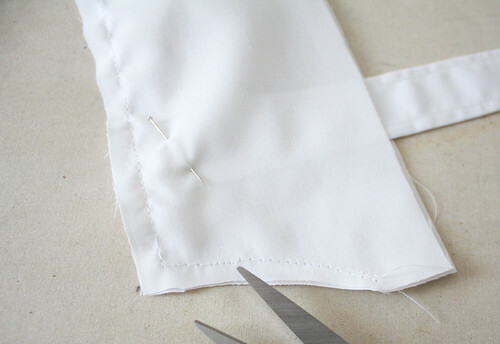 Sew around bottom to create hem. 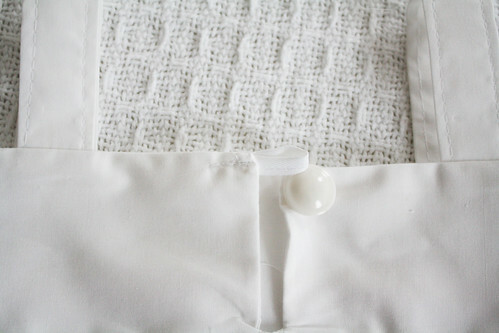 Lastly, sew on a button and closer on the back top. For the closure, I folded a piece of twill tape in half and sewed it like that. 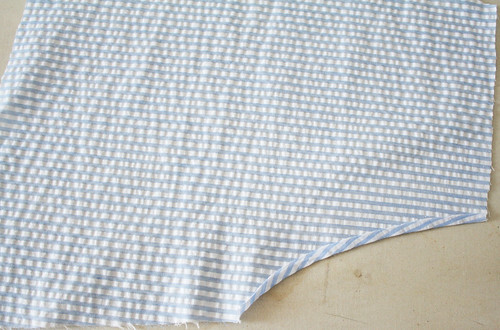 Then, folded it in half and sewed the ends on the inside top left. L.O.V.E. this so much. I have an old onesie of my daughters that I think I will just cut the bottom off and just make the ‘skirt’ part of the dress and attach it to the shirt. I can’t wait to go into town and snag some material for this. Thank you so much for sharing! That is so cute, it looks like something you would find in an expensive children’s store. If my girls were a little younger I would try it. Oooh! I love it! That fabric just screams “sailor outfit”! Your little girl is growing up – sniff. I love this cute little dress! Thank you so much for sharing! I love the dress! Very creative. Super, super cute. 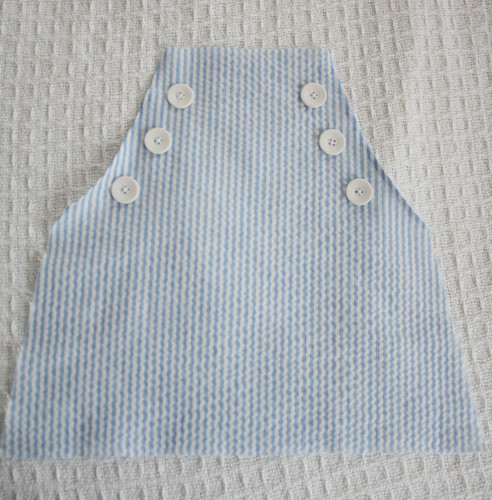 I just have a little boy to sew for so I think I will just have to make one for myself! 🙂 The blue striped material is seersucker, right? Oh my goodness, if that isn’t the cutest thing I’ve ever seen!! I’ve got a thing for nautical things and that is A-dorable. Great job on the dress and your model is too cute!!! That’s just gorgeous! 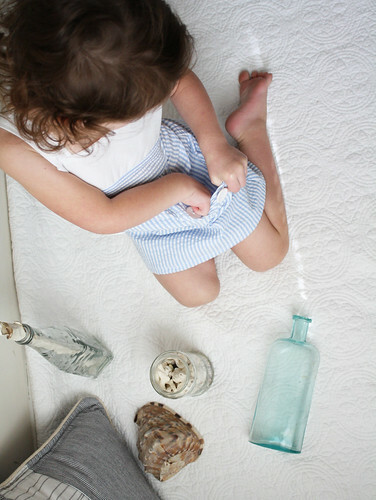 I’ve added it to my list of projects to try when my yet to be born baby girl is bigger. ahhh! love this cute little dress. If only I had a little girl to make one for! lol. Make one for “Dress a girl around the world”! They take dresses and get them to girls all over the world who need them! I don’t have any girls, (two boys) but have adopted the girls around the world so now I can make the dresses! THANK YOU!!! I think this dress just bumped up to the top of my to-do list. I am so excited to see this tutorial! – I loved the dress when you first posted it. My daughter is 6 months so it will have to wait until next summer. 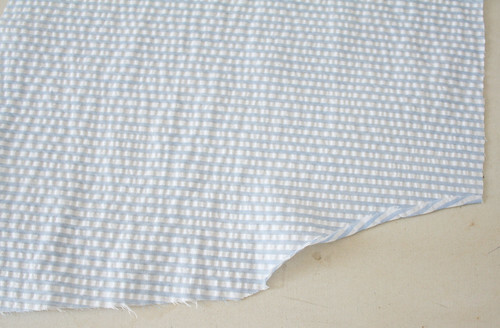 The stripe fabric is seersucker 🙂 But many types of fabric will work. too cute. I love searsucker! I will have to try one with sleeves. I just found out that bee’s kindergarten for next year has a dress code for sleeves. Everything now must have sleeves! hmmm. Darling! Nautical rocks! I will feature this at somedaycrafts.blogspot.com. I love this dress and was really hoping for a tutorial when you posted it. I have one question do you sew the pockets at the bottom or are they open to the hem? Thanks again for all your hard work. They are open, so you just fold it all up in the hem. you have got to make this into an adult version! i would die to have this dress, and i’m 25! You amazing seamstress- you! 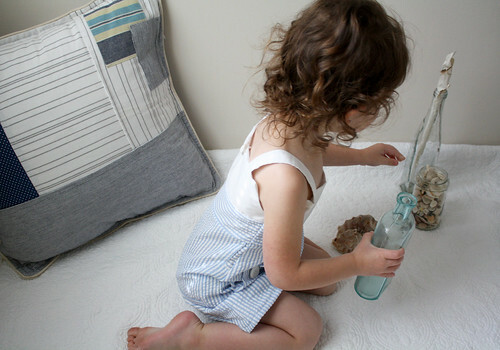 I want to attempt to remake this lovely dress- in my size! I’m another Jacksonville, Florida blogger and new follower. The hot weather certainly warrants a sweet (thin!) dress like this one! Oh my gosh, Jessica! This is the most darling little dress! And you sure have a cute little model! 🙂 What a great tutorial too — wonderful! Taht is ridiculously cute! Thanks so much for this, I’ll be linking. Oh My Goodness that is the cutest thing I’ve seen in a long time!!! 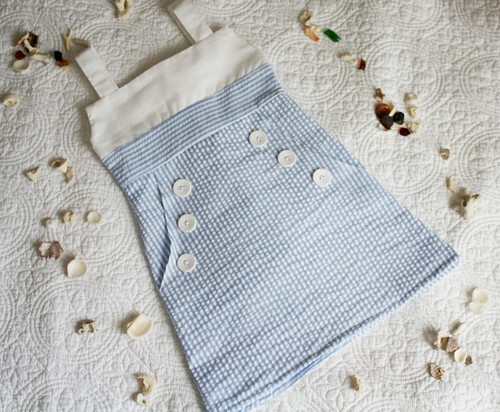 My husband is a sailor…and I have 2 little girls that will be getting this dress as soon as I can get to the fabric store. LOVE it!! This is such a sweet dress…and perfect for going to the beach! Thanks for sharing! what a cute and lovely little dress!! Many thanks for the tutorial!!! I am looking for a little dress to make for my niece´s micey mouse bday party.. i think it would look lovely with the bottom part in red with white polka dots! Too cute. I want one in my size! This is adorable and such a great tutorial!! I love the seer sucker fabric!!! 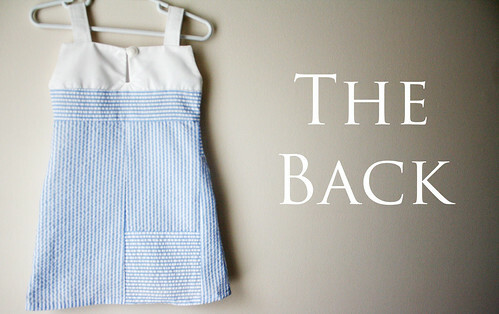 I made a 4th of July sundress with the same exact light blue seer sucker fabric, I loved it, but I have to admit that had I seen this first…. oh my!!! This is so cute!! I desperately want one for myself! 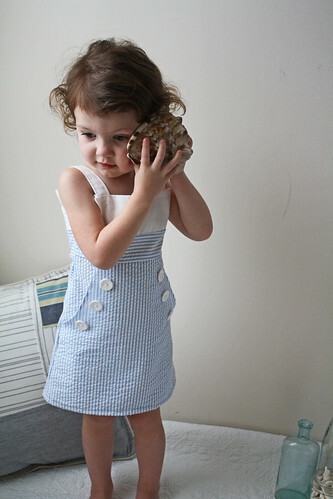 Or even cuter, if you made yourself a matching dress (and tutorial *wink wink*) and then you two would be twinsies! I love mommy/daughter matching dresses! So adorable! What a well written tutorial! Makes me feel like I can maybe do it, even as a newbie. I think this is one of my favorites of the dresses you have made. Beautiful! I have a little redhead girl, and this would be just adorable on her!!! I posted a link to this on my “ideas” page. now I just need to find the time to do it! I want one my size that is so dang cute!!!! hey there, i followed your tutorial on the weekend and i am super happy with the outcome. could i please ask what size your dress is? I would say this is a size 2. My daughter is a 2/3 but is slender. Are you for reals?! That is the CUTEST dress ever. Your daughter is so lucky to have a mommy like you. O my word. That is just the cutest dress ever, Jess. Thanks for sharing your how to! 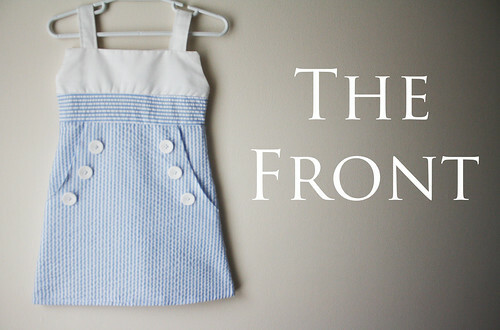 This is such a sweet little dress, and the tutorial is great. I am posting it (with the link) in my blog, ok? A friend sent me this and I just wanted to say how much I loved it — the perfect dress! And treasure pockets are such a great idea. I really love the detail on the back. Super Cute! I wish I had a little girl to make one for. 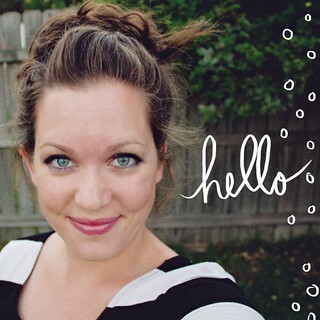 Hi, this is Bethany from lilbitandnan.blogspot.com. 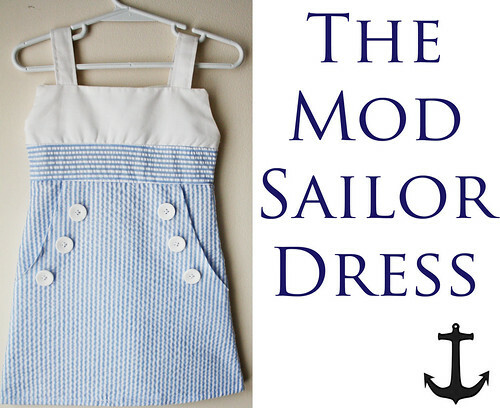 I wanted to let you know that I linked your mod sailor dress tutorial on my blog. This is amazing, I am making one for myself! This is awesome!!! I can’t wait to make one for each of my 3 girls. I bet even my 15 year old will love it. Thank you so very much for sharing. I was wondering do you think this would work if I atttempted to make this in an adult size? 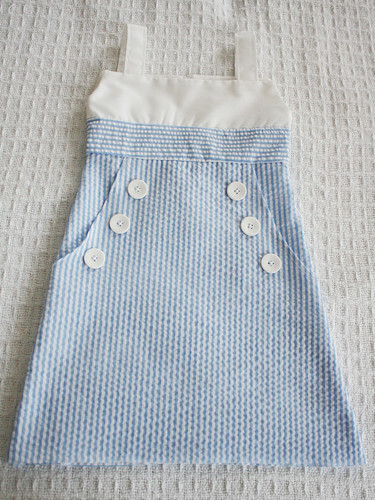 I know it sounds terribly cheezy but I would like to make matching dresses for my three year old daughter and myself. You could totally do one for yourself! I would recommend possibly starting with a similar pattern (like this for example http://www.simplicity.com/p-5094-misses-sportswear.aspx). Simplicity patterns go on sale at JoAnn’s for $1 quite frequently. Then just add the front pocket and the top flap if you like. I want to make one for me!! i LOVE it, thanks! 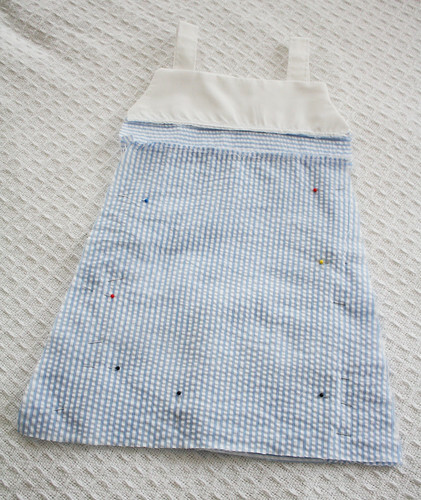 I managed to sew this for my daughter today – it’s not often that I start what the author promises is a simple tutorial and actually get it finished. I did it in a tweed fabric with a bow instead of buttons for my daughter’s winter wardrobe (Southern hemisphere 🙂 It turned out very cute – thanks for such a great tutorial! I would like to thank you very much for this great idea. I made one this afternoon for my granddaughter. Its easy and fun to make thank you again. Going to have to try this for my grand daughters. Very cute. Thanks for a fun and easy dress! i don’t understand why there is a patch of the stripes going the opposite direction on the back of the skirty? O vestido é uma graça mas a princesa é de uma elegância só! Parabéns e obrigada pelo tutorial. Thank you so much! 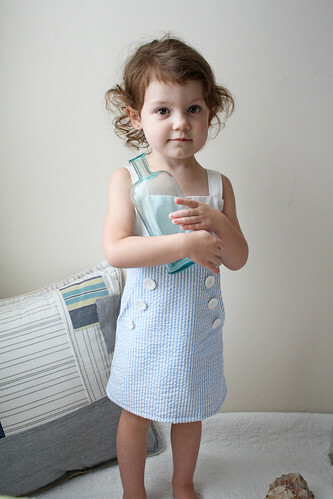 Adorable dress and easy to follow instructions. I was a little intimidated by the create your own pattern part but it turned out to be super easy. I made two dresses over the weekend for my daughters to wear for my son’s upcoming Sailor birthday party. They turned out great. Love, love, love this dress! Thank you 🙂 That was just me trying to use the fabric I had lol. I didn’t have enough, so I had to kind of piece it together and it came out like that. I made this dress today, It is purple though. It turned out amazing. 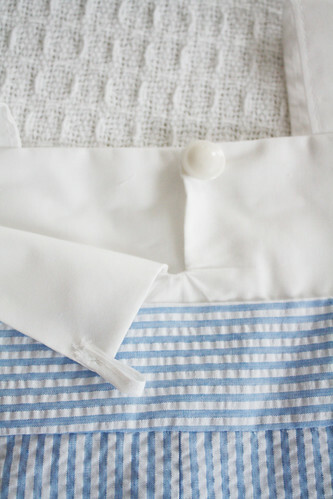 I am no sewing pro and this tutorial was painless. So easy to follow!! Thank you, can’t wait to make more!!!! I just used white cotton fabric (probably came from the quilting fabric section) 🙂 Thanks so much! Lovely! And you made it look so simple.. Thanks a lot!!! Like the dress, but would have left pocket off of the back. It looks out of place. Thanks 🙂 There is no pocket on the back of the dress though. Just pieced together fabric because that was all I had.